While I realize pineapple is in no way part of the local and seasonal foods I normally like to explore (Illinois is certainly not the tropics), this is a great fruit to discuss for summertime. Pineapple is one of this Educator's favorite fruits, and almost nothing – to me – beats the taste of fresh pineapple. However, the daunting task of picking fresh pineapple, knowing when it is ripe, and figuring out HOW to cut it meant I bought only canned pineapple or the variety in the individual plastic cups for years. The flavor and texture was just not the same as fresh. Fortunately, I found my "confidence on today's menu" to work with fresh pineapple. Long-time readers of "Healthy Eats and Repeat" may recognize this phrase from past posts. It is meant to inspire readers to gain confidence in eating well and trying new foods. It took a lot of trying and retrying (and patience) to feel comfortable with all the nuances of fresh pineapple. But now I know what to look for and can cut up a large pineapple in 10 minutes (including clean-up) – down from 20 minutes or more when I first started. My reward for those 10 minutes is having lots of pineapple chunks to eat on throughout the week. Yum! While you can find fresh pineapple almost year-round in stores, the best quality and lowest prices are typically found in summer months. Buy: Look for fresh pineapples that are firm and yellow-green. Buy pineapples without soft spots, mold on the bottom, or areas of decay. Already ripe pineapples will have a sweet smell. Leaves should be green, without much wilting or many dark spots. If choosing processed pineapples, such as juiced, frozen, or dried, look for those without added sugar. Price: According to the U.S. Department of Agriculture, on average, fresh pineapple is around $0.70 per cup. Canned pineapple is around $0.50 per cup. Fresh pineapples are often sold at a single price, rather than per pound, so buy large pineapples to get the most for your money. Store: Keep fresh pineapples at room temperature until ripe and ready to cut. 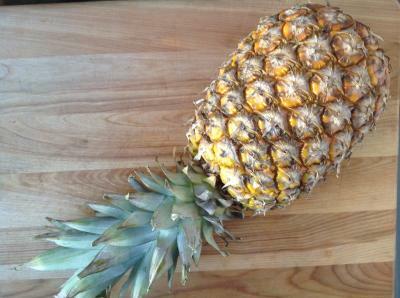 To tell if a pineapple is ripe, look for signs of the following: sweet smell and a change in color to be yellow-brown. Or try pulling a center leaf; a pineapple is usually ripe when that leaf is easily plucked. If leaves resist or do not budge, wait another day or two. Prepare: Cut into desired sized pieces and store in the refrigerator. Follow some general steps below to get chunks of pineapple. But certainly find your own way to cut into other shapes and sizes. 1. Rinse outside of pineapple in cold water. 2. With a large knife and secure cutting board, cut off stem and bottom ends and discard. 3. Cut pineapple in half from top to bottom. 4. Cut each half in half again to give 4 quarter pieces. 6. To each quarter, cut off skin, including eyes that might be left behind. 7. Slice each cored and peeled quarter into pieces. Eat: Eat pineapple within 1 week of cutting or opening, as in the case of canned pineapple. Commonly eaten as a fruit side to meals or as a snack, pineapple and its juice work well in sweet and savory dishes. See the FOOD SCIENCE HIGHLIGHT below to learn more about using pineapple in marinades. Let fresh pineapple shine in uncooked dishes, like this visually-stunning salad recipe. Enjoy the colors of this easy fruit salad. For the size of this recipe, take some to a summer celebration to share. And consider trying other colors of fruits, such as green grapes for kiwi or watermelon for strawberries. 1. In a large bowl, combine all fruits. Divide into several small containers, cover, and store in refrigerator until ready to eat. WEB HIGHLIGHT 1: Enjoy "Food Fun from Apples to Zucchini: Pineapple," a fun kid-friendly website to learn more about pineapple and other foods. WEB HIGHLIGHT 2: Did you know you can grow a pineapple top? Read more on how with the Grow a Pineapple Top press release from UI Extension. 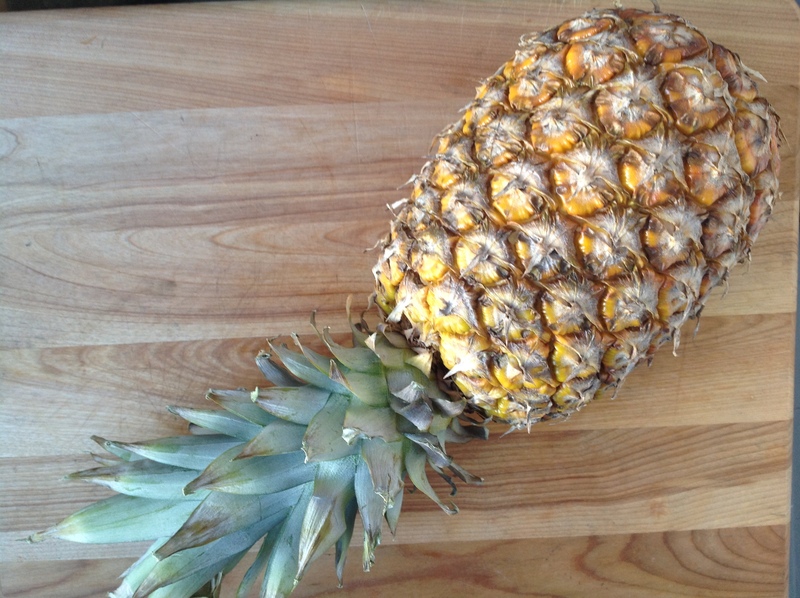 FOOD SCIENCE HIGHLIGHT: Bromelain: Bromelain is an enzyme found in fresh pineapple. Marinades with fresh pineapple juice can be used to tenderize meat – just not for very long or the meat becomes mushy. Due to heating, canned pineapple and pineapple juice do not have active bromealin.